Magnetic Car Signs at greatly discounted prices. Many sizes and shapes of car magnets are available. We have one to fit your advertising needs. If no other purchase is made, please add $10 art charge to the below. Contact us for quantities not shown above. PMS colors beyond standard colors may have additional charges. If no other item is purchased, please add $10 for first time art work. 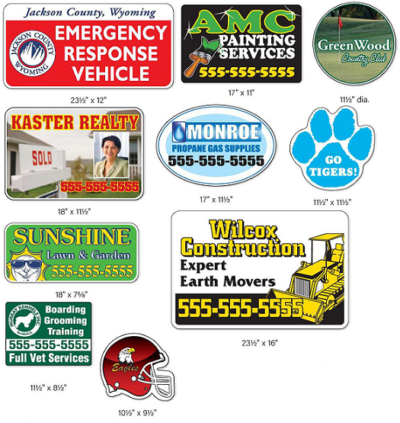 Regular prices for these magnetic signs are below. Prices listed are per sign. Prices for one color are listed, with the additional cost for each additional color listed beneath. For additional quantities, sizes, or other options not listed here, contact us at (321) 253-0424. Combo Discount – If you buy $250 or more of any other item from Heritage Advertising, get magnets at 5% off for up to 24 magnets.